Ruben Um Nyobè is a little known but major figure in the African independence campaign. He was the first African political leader to claim independence for his country before the General Assembly of the United Nations. He is called the “black Hô Chi Minh” by some authors and “Mpodol” (spokesman) for his country, Cameroon. Um Nyobè was born at Song Mpeck in the Cameroon on April 10, 1913, when it was still a colonial possession of Germany. His first education came in Presbyterian Church primary schools, and he was baptized in 1921 as a Presbyterian. While he was in school, colonial administration of Cameroon was transferred from recently-defeated Germany to France and Great Britain at the end of World War I. Eventually, Nyobè and other Cameroonian nationalists sought to reunite the now divided territory. In 1929 Um Nyobè earned his first school leaving certificate, and in 1931 he enrolled in a training school for primary school teachers in Fulassi. He was dismissed, however, in the last year of his training because he criticized and protested against the type of education he had received. He did later obtain his degree as teacher. After teaching few years, he joined the colonial civil service in 1935 but continued to study independently and obtained a Bachelor of Secondary Education in 1939. He then was sent to Edea Court of Law as registrar. While working there, Um Nyobè developed a passion for international law and discovered the unfairness of French colonialism, including the laws which segregated the French from the indigenous Cameroonians. In 1945 shortly after World War II ended, Um Nyobè helped found the Union of Confederated Trade Unions with the support of the General Confederation of Workers (CGT) of France. Um Nyobè became the first general secretary of this labor organization. Here he fought for better conditions for Cameroonian laborers and tied their poor condition to the colonial system. He argued that only the political independence of his nation would ameliorate the working conditions of these laborers. Three years later, the Cameroon People’s Union (UPC) was founded in 1948 in Douala and soon became one of the most important nationalist political parties in Sub-Saharan Africa. Um Nyobè became the leader of this party, serving as its general secretary, a position that made him the most visible independence leader in his nation. Because of his responsibilities in the UPC party, however, Um Nyobè left the labor union he had helped create three years earlier. In 1952, 1953, and 1954, Um Nyobè traveled to New York City, New York, to appear before the United Nations General Assembly where he repeatedly denounced the French colonial rule in Cameroon and called for the immediate reunification of French and British Cameroon. He also requested the fixing of a deadline for independence and called for a Cameroonian Legislative Assembly. The French colonial administration responded by initiating a persecution of UPC members in 1955. Many of them were arrested or killed, and some were exiled to other nations. 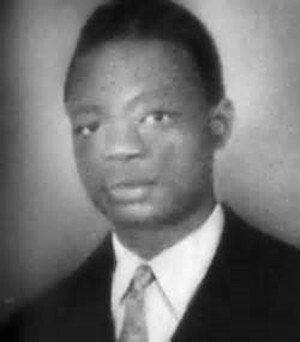 Ruben Um Nyobè organized a non-violent resistance movement much like the one Gandhi led in India in the Cameroonian equatorial forest and continued to claim independence and call for democratic elections. He was slain by the French Army on September 13, 1958, near the town of Boumnyébel. He was forty-five. French authorities then proceeded to ban his memory as well. Most of his writings were destroyed, and Cameroonian residents were forbidden to speak his name in public. J.A. Mbembe, La naissance du maquis dans le sud du Cameroun (The birth of the Maquis in the Southern Cameroon) (Paris: Karthala, 1996); R. Um Nyobè, Le problem national Kamerunais (The Kamerunian national problem), Edited by J.A. Mbembe (Paris: L’Harmattan, 1984); http://www.bonaberi.com/article.php?aid=1544. Edited by J.A. Mbembe (Paris: L’Harmattan, 1984); http://www.bonaberi.com/article.php?aid=1544.